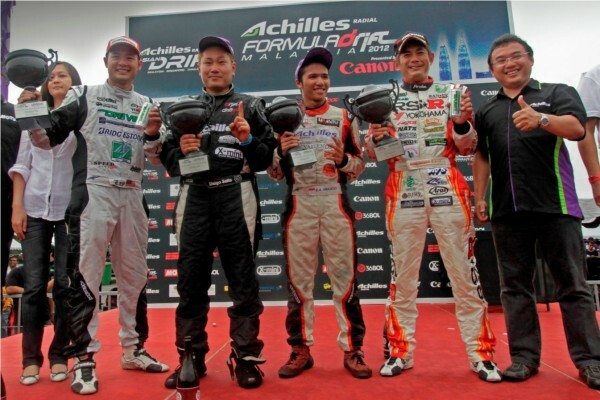 20 May 2012 (KUALA LUMPUR): Daigo ‘The Ninja’ Saito of Achilles Drift Team triumphantly beat drift legend Manabu ‘Max’ Orido for the second consecutive year to be crowned champion of Achilles Formula Drift Malaysia 2012, presented by Canon, while Malaysia’ Tengku Djan Ley of M7Bridgestone rounded up the podium in his comeback race in third place. The day belonged to Daigo with his flawless and gutsy display of precision drifting at Speed City KL, kicking off the first leg of the series on a winning note. The all-Japanese finale was a rematch from last year that saw Daigo demonstrate his aggressive style. In the first run, Daigo blasted off to an insurmountable lead that forced Orido to play catch up. In the reverse run, Daigo repeatedly put pressure on his compatriot, chasing him and sliding close with only inches to spare – keeping the crowd on the edge of their seats with plenty of slick drifting. The race also saw the return of Djan after a one-year hiatus. He clinched his 3rd-place finish by knocking out Emmanuel ‘Dio’ Armandio of Indonesia, after losing to eventual champion Daigo in the semi-final where the 8000-strong crowd made themselves heard in the highly anticipated encounter. This year’s event saw the drivers contend against the weather, in addition to each other in the tandem battles, with the rain adding an element of unpredictability that proved to be too much for some. It saw local ace Ser Ming Hui, aka ‘Ah Fai’, from Achilles Drift Team Malaysia crashing out in the round of 16 against Indonesia’s Dika CH, despite entering today’s competition as the second seed. Djan, who led the Malaysian contingent by qualifying to the round of 32 with the highest score of 94 out of 100 in the first rounds, showed a clear indication of the quality of Malaysian drivers. Seven Malaysians made it to the round of 16, with the likes of Ivan Lau of Achilles Drift Team and Ee Yoong Chern of GT Radial joining Tengku Djan in the quarterfinals. 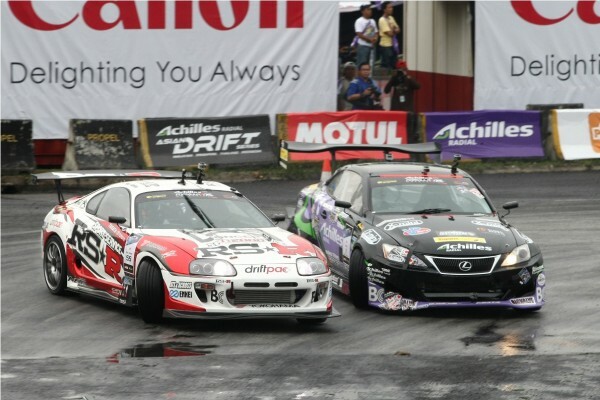 Today’s race marks the beginning of the Achilles Formula Drift Asia Series 2012. The next leg will be at Singapore on 30th June – 1st July 2012. 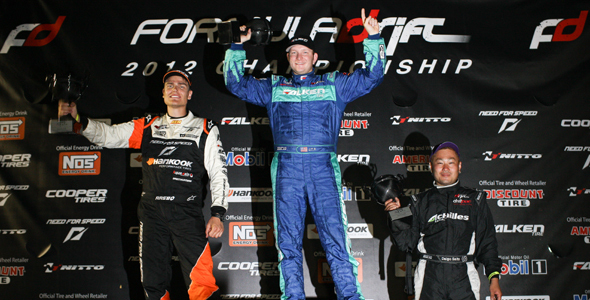 Long Beach, Calif. – May 12, 2012 – Formula DRIFT returned to Road Atlanta for Round 2: Road to the Championship. Justin Pawlak takes the victory in the Falken Tire Mustang increasing his point lead in the Pro Championship Points Standings. Round 2: Road to the Championship brought the Formula DRIFT Pro Championship back to the Series birthplace nine years ago. Fans came in droves seeing an increase in attendance at Road Atlanta. This marks another consecutive season of growth. Justin Pawlak takes his second consecutive victory to increase his points lead. Additionally, Pawlak is now the points leader in the Tires.com Triple Crown bonus prize. Pawlak faced Fredric Aasbo in the Need for Speed / Hankook Scion TC and edged out the 2010 Rookie of the Year to take the victory. Walker Wilkerson in the Falken / Fatlace / Garage Autohero Nissan 240SX battled Formula DRIFT rookie, Daigo Saito in the Achilles Tire / Bridges Racing Lexus SC430 in the consolation round. 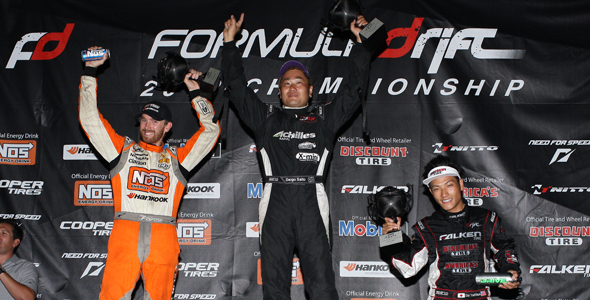 After a one more time battle Saito beat out Wilkerson to take his second third place finish of the season. The Formula DRIFT Pro Championship continues with Round 3: Invasion at West Palm Beach International Raceway on June 1-2, 2012. Long Beach, Calif. – May 1, 2012 – Formula DRIFT has announced today the continuation of the popular online program, “Formula DRIFT Insider.” The first episode will premiere on Thursday, May, 3 on Formula DRIFT’s social media outlets and website. After a successful trial during the last 10 weeks of the 2011 Formula DRIFT Championship season, Formula DRIFT will launch the second season of “Formula DRIFT Insider,” this Thursday, May 3. Subsequent episodes will air every other Thursday until the conclusion of the season in October. Formula DRIFT Insider will cover much of the behind the scenes action of the world’s premier drifting organization and go on the road with teams, drivers and staff to show exclusive access never before seen to the public. The show will continue to be hosted by Formula DRIFT co-founder, Ryan Sage. The first episode of Formula DRIFT Insider will have an exclusive interview with 2011 Champion, Daijiro Yoshihara, an exclusive news release surrounding one of the top teams in the Series and finally a surprise surrounding the second round of competition at Road Atlanta, which takes place on May 11-12.